Ranchi : Social activist Swami Agnivesh was on Tuesday assaulted by a group of suspected Bharatiya Janata Yuva Morcha (BJYM) activists shouting “Jai Shri Ram” slogans at Pakur in Jharkhand, following which the state ordered a probe. Chief Minister Raghubar Das ordered the probe into the assault which, informed sources said, will be inquired into by the Commissioner and DIG of Santhal Pargana. Police said a group of persons pounced on the 78-year-old activist as he stepped out of a hotel to get into a car to take part in the 195th Damin Mahotsav at Littpara. Pakur is located around 360 km from state capital Ranchi. “Go back Agnivesh, go back Agnivesh! You have to recite Vande Matram if you have to stay in India,” his assailants shouted as they rained blows on him. Even as he kept asking what they wanted, the attackers thrashed him. Agnivesh fell to the ground but the beating continued. His aides did their best to save him. The BJYM workers alleged that Agnivesh had come to instigate the tribals at the behest of Christian missionaries. “I am against any sort of violence. I am known as a peace-loving person. I don’t know why I was attacked,” a visibly shaken Agnivesh told NDTV. 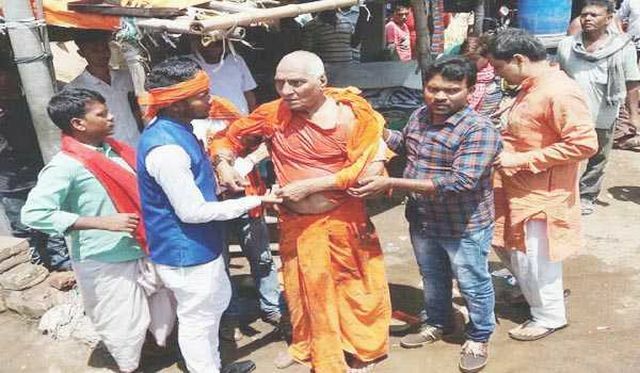 Pakur Superintendent of Police Shailendra Barnwal said that police authorities had no information regarding Swami Agnivesh’s visit. He said that no guilty would be spared. On the other hand, Swami Agnivesh and organisers said that the administration was informed regarding his programme. Jharkhand Police Spokesman R.K. Malik said that an FIR had been lodged and raids were on to arrest the attackers. Police detained 20 people but no one was arrested. The opposition Congress and Jharkhand Mukti Morcha condemned the attack. “This is most unfortunate. We demand the immediate arrest of the culprits,” Congress Spokesperson Alok Dubey told IANS. Agnivesh said that there were no policemen around when he was assaulted. “Local reporters told me that BJP youth wing’s workers were outside my hotel to protest against my visit but I was completely taken aback by the violence,” he said. “I offered to hold a dialogue with them. But nobody came to speak to me. I was going to a sammelan (seminar) with my tribal friends when they attacked… without warning, they pounced on me,” Agnivesh said. The social activist likened the attack to mob lynchings in several states in the past year. Join Amani in a Live Twitter Q&A About the #MuslimGirlBook!